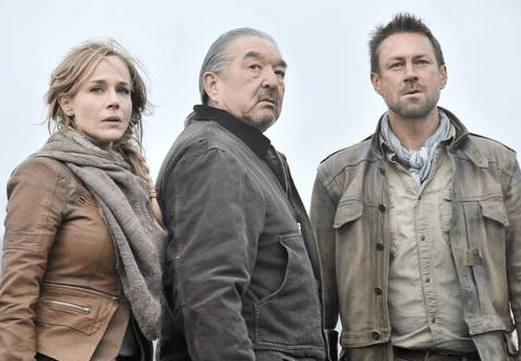 SF will fast-track the new US / Canadian sci-fi series Defiance, starring Grant Bowler. Described as a “world first” the series launches on April 18 with its own online game available on PlayStation 3, Xbox 360 and Windows PC from April 11. I guess it begs the question, will the game outlive the show? Hitting Australian televisions within 55 hours of airing in America, Defiance marks a new era in entertainment by being the first-ever series to unite television and online gaming, with the two platforms featuring an interconnected world that influences and impacts the other as the series develops. Defiance stars Australian lead Grant Bowler (Nolan), Julie Benz (Amanda Rosewater), Stephanie Leonidas (Irisa), Tony Curran (Datak Tarr), Jaime Murray (Stahma Tarr), Graham Greene (Rafe McCawley) and Mia Kirshner (Kenya) and is set in a future Earth scenario where aliens and humans must co-exist on the same planet. “For the first time on SF, Australian audiences will be transformed from passive viewers to active participants, as they join tens of thousands of other fans exploring an advanced online world that is directly connected to the action on-screen”, says Peter Hudson, CEO of SF. Defiance the TV program comes from the minds behind Battlestar Galactica and Caprica. Defiance is a 13-episode series and begins with a two-hour episode on Thursday April 18 at 9.30pm EST on SF, first on FOXTEL. The game has been developed by Trion Worlds, a leader in the premium games market. It will be distributed by Namco Bandai in Australia and will be available on PlayStation 3, Xbox 360 and Windows PC from April 11. Set in the year 2046, Defiance introduces an exotically transformed planet Earth following the sudden – and tumultuous – arrival of seven unique alien races. In this somewhat unpredictable landscape, a diverse and newly-formed civilization of humans and aliens must learn to co-exist peacefully. Each week, viewers will follow an immersive character drama set in the boom-town of Defiance, which sits on what used to be St. Louis, while in the game, players will adventure in the new frontier of the San Francisco Bay area. The dramatic tapestry of the series and intense action of the game will exist in a single universe where their respective narratives will inform one another and evolve together into one overall story. Thursday April 18 at 9:30pm EST on SF. I liked the movie length pilot, good mix of special affects with a good back story. Just a shame they have no plans for the game to come to Mac. Might need to look at getting a PS3 or xBox. The promos for this look good, check them out on YouTube.